High water washed across Highway 34 east of Corvallis, putting more traffic on Highway 20 and causing gridlock near the Ellsworth Street Bridge outside Albany. 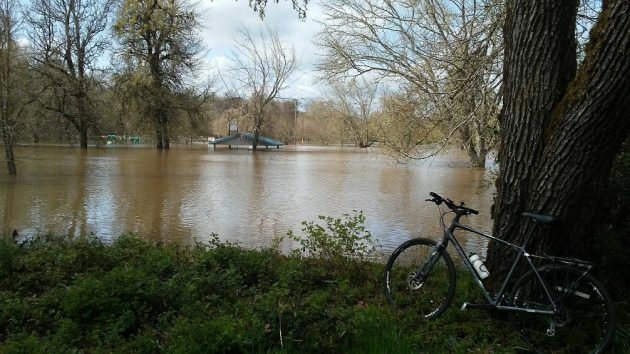 The Weather Service said the Willamette at Corvallis would rise above flood stage tonight and won’t crest — at 31.6 feet — until late Wednesday morning. So you can expect Highway 34 to be closed Wednesday, too. Commuters having to cross the river might want to get a very early start or, better yet, take the day off if they can. Based on forecast rainfall and temperatures, as well as current and planned releases from the reservoirs, the Weather Service continued its flood warning along the Willamette in this area until Thursday afternoon “or until the warning is cancelled.” The next update will be issued at 5 a.m. Wednesday. The warning covered the Willamette from Harrisburg to Albany. 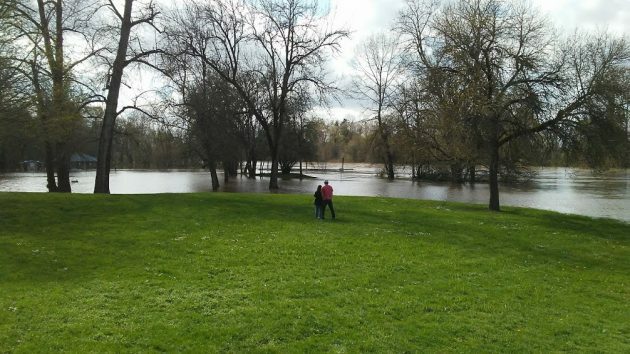 In Albany, the Willamette topped 23 feet at 6 p.m. Tuesday and is expected to crest at 26.56 feet Wednesday evening. Flood stage is 25 feet. 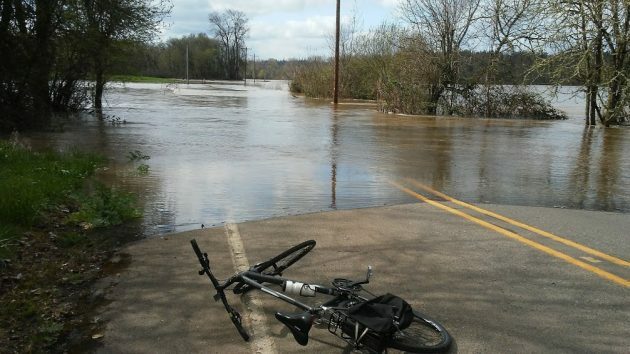 “Above 27 feet, expect some flooding in Bryant Park, as well as some flooding in South Albany,” the Weather Service said. I guess they hadn’t looked at Bryant, where the entire park except for a couple of high spots was under water with the river at “only” 23 feet. All of Bryant Park was under water on Tuesday afternoon. So was most of Bowman Park except this grassy hillside. There was no place to lean the bike on Bryant Way on Tuesday afternoon. FYI, at Peak Sports they have a spiffy stand that mounts on rear frame of a bike. As for he flooding…so what’s new? Happens every year to varying levels. Mountain bikers have a thing against kick stands, I guess. When I first rode a mountain bike similar to Hasso’s, I missed the stand and installed one I removed from my old hybrid bike. After a while it seemed more a nuisance than anything useful and I removed it. Occasionally I miss it. Why would anyone take FEMA warnings seriously regarding building in known flood zones when the City, our most local governing body, not only built parks in a flood zone, but continue to rebuild/reboot those same properties year after year…flood after flood. All this, it seems, with the full, or at least tacit support of the body politic. It seems the definition of insanity. They build the parks knowing they will be flooded, they’re designed that way. The city does have some pretty smart people, they don’t just throw something at the wall and see if it sticks. The residents can use the land during times of the year when there is no danger of flooding, hence the concerts, softball tournaments, movies, fireworks this year, and it’s not on build-able land in the UGB. If you want to throw darts at the city that’s fine, but if they’re doing something correctly give them kudos also. Probably because you don’t live in a park 24/7 like a house. Those who are relative new comers to the Mid Valley don’t have much to complain about. They should have been here in December 1965. Seems as though a coffer dam that was in use at the Foster or Green Peter dam construction sites gave way. There was a warm up and the snow pack began a quick melt, it rained and BANG there was a flood. I had vacation scheduled for the week of Christmas break and the day after it started highway 20 was closed with water across it several feet deep from the foot of the Ellsworth St. bridge to the dip in Hwy 20 just east of Scenic Dr. The building which now houses Toms Garden Center was surrounded and the water came within about 1 inch of flowing into the building. People were walking across the railroad bridge to get into town to get groceries unless they drove to Corvallis which could be done by using county roads. My parents lived near Halsey and in order to reach their place for Christmas dinner we had to drive through Monmouth, Salem and down I-5. The water dropped the day before I had to return to work. We should all be thankful that the current dams on the Willamette and it’s tributaries are in place and God help us if they are ever removed. It is an inconvenience to take a round about route jammed up with other vehicles but the high water wont last long. Hey, I’ve got an idea. Stop harping about another bridge. Lets just move the river. The flood was in 1964 not 1965.